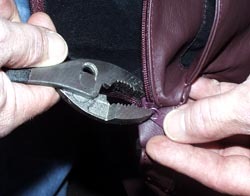 The most common zipper complaint is when a zipper refuses to close. Separating as you pull the slider to close the zipper. This occurs when the tension of the slider portion of the zipper lessens to the point that it no longer pulls the teeth tightly together. We use self- healing zippers that are easily tightened fixing the problem 99% of the time. 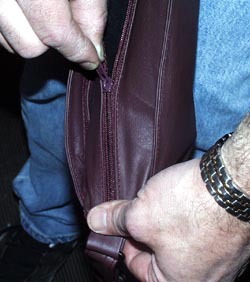 Here are a few easy step by step instructions to walk you through tightening your zipper. Open the zipper all the way. 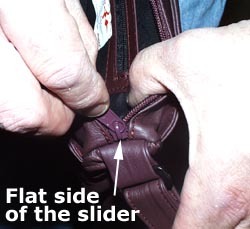 You will know your zipper is opened correctly when the flat side of the slider is resting snugly against leather. Now grab both sides of the zipper teeth and pull pushing the flat side of the slider even more firmly against the leather. 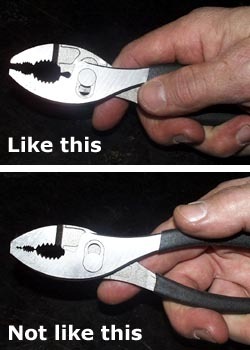 Position the pliers on either side of the slider both inside and outside of the pocket and gently pinch together. Then close your zipper. 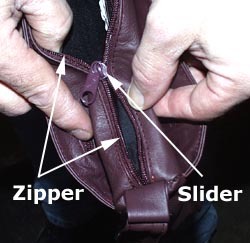 It is important to not pinch too hard as you can over tighten the slider and make it hard to move on the zipper. It is best to do this process several times until your zipper closes smoothly. Remember it is the tightness of the slider that pulls the teeth of the zipper together. 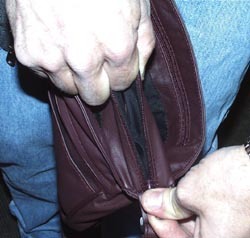 With this simple tightening maintenance you will increase the life of your purse and save on expensive zipper replacement. Good Luck. If you need further assistance please contact us and we will be happy to help you.